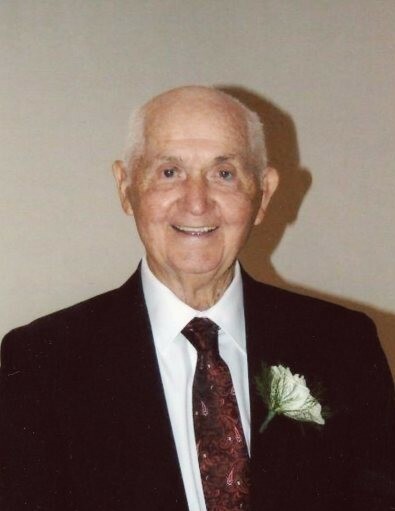 Obituary for Joseph Michael Beason | Matthew X Merlin Funeral Home, Inc.
Joseph Michael Beason, 89, of Millwood/Derry, passed away peacefully on Saturday, April 28, 2018, at Greensburg Care Center. He was born August 16, 1928 in Brenizer, the son of late Joseph and Virginia (Nahaj) Beason. Prior to retirement Joe worked at Derry Westinghouse for 42 ½ years. He proudly served in the US Marine Corp in China and Japan during WWII. Joe was a member of St. Joseph Roman Catholic Church, Derry, Derry VFW Post 444, Derry American Legion, Greek Club, Slovak Club, and White House Club. He was an avid golfer and member of the Chestnut Ridge Golf Course. Besides his parents Joe is preceded in death by his five sisters Virginia Falk, Mary Skoloda, Anna Reed, Rose Gennaro, and Caroline Paola; one brother John Beason, and two sons-in-law Robert and Richard Washinko. Joe is survived by his devoted and loving wife of 70 years Jean (Tommasini) Beason of Millwood/Derry; two daughters Cheryl Washinko of Derry and Vicki Washinko of Columbiana, OH; one son Joseph Beason of Harrisburg; one sister Irene Lloyd; five grandchildren Michelle Banks (Chuck), Amy Schneider (Bob), Cara Washinko (Darin Henigin), Jenna Washinko (David DeJesus), and Carly Thompson (Jeremy); five great grandchildren Charlie, Kali, Ella, Ava, and Lyla; sister-in-law Sue Tommasini and many nieces, nephews and friends. Family will receive friends for Joe’s Life Celebration 3-8 PM Monday April 30, 2018 in the Matthew X. Merlin Funeral Home Inc. 529 N. Chestnut St. Derry, PA 724-694-8331. A Mass of Christian Burial will be held 10AM Tuesday May 1, 2018 at St. Joseph Roman Catholic Church with to Rev. Salvatore R. Lamendola as Celebrant. Interment will follow in the St. Joseph Cemetery, Derry The Blairsville Military Service Group will conduct Military Honors at the cemetery. The family would like to give a special thanks to caregiver/granddaughter, Cara Washinko, nieces Catherine Yesho, and Lorraine Jacobs. Online condolences may be made to www.merlinfuneralhome.com.